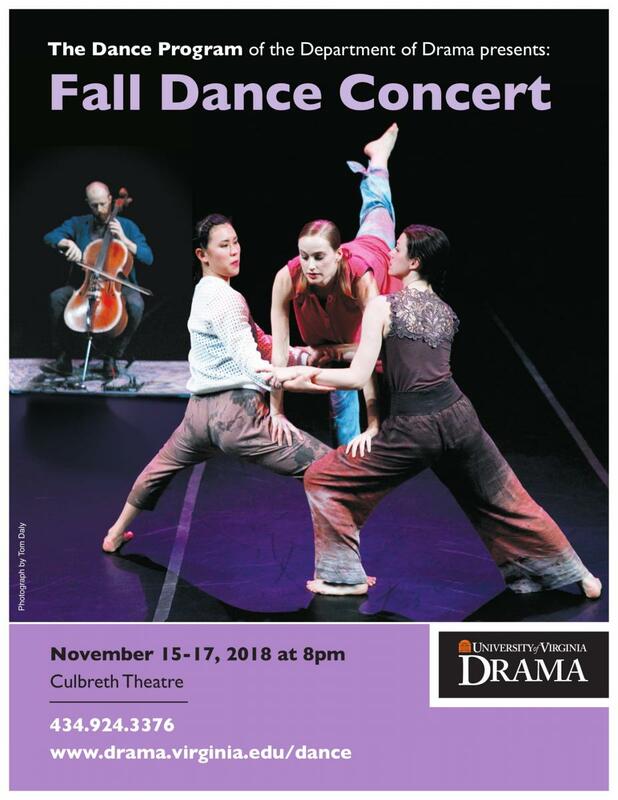 The Dance Program of the Department of Drama at the University of Virginia presents its Fall Dance Concert November 15-17 at 8:00 p.m. in the Culbreth Theatre. This year’s Fall Concert is the result of a special, semester long collaboration between the Dance Program of the Department of Drama and the McIntire Department of Music, organized by Head and Artistic Director of Dance Kim Brooks Mata and Assistant Professor of Music Composition Leah Reid. Student dancers, composers, choreographers, faculty, and musicians worked in partnership to create new works that explore sound, space, and movement. Students participating in this concert were mentored through this engaging and challenging co-creative process by dance, composition, and performance faculty members. Six student and two faculty choreographed pieces round out the concert. Head and Artistic Director Kim Brooks Mata’s piece threadbare is the result of this semester’s collaboration with graduate student composer Juan Carlos Vasquez and the cast of student dancers. Beginning with explorations of concepts such as permeate, threshold, and threadbare, this work was generated collaboratively with artistic input from the dancers, composer, and cellist. The dancers explore orienting themselves within a layered sonic, conceptual, movement filled environment that continues to shift and change in varying degrees. Juan Carlos Vasquez is an award-winning composer, sound artist, and researcher whose electroacoustic music works are performed constantly around the world and have been premiered in 28 countries across the Americas, Europe, Asia, and Oceania. He is pursuing a Ph.D. in music at UVA. In Latter, choreographer Rachel Good and composer Martin Moro explore connection and disconnection and the bridge between these states. The piece also examines the connection between sound and movement, exploring both harmonious and dissonant relationship. Good is a 4th-year UVA student majoring in Aerospace Engineering and minoring in Dance. Moro is a pianist, composer, and composition student in the UVA McIntire Department of Music. In addition to the above, we will be showcasing other original works by student artists Erin Perry, Paul Redling, Madeline Smith, Aiman Khan, Deanna Lewis, Grady Tollison, Kyle Lofland, Lauren Bredar, Mattias Zuffoletti, and Omar Fraire. Tickets for the Fall Dance Concert can be purchased online at www.artsboxoffice.virginia.edu, by calling 434-924-3376 or in person at the UVA Arts Box Office, located in the lobby of the UVA Drama Building, open Monday through Friday from noon until 5:00 p.m. Tickets are $7 for adults, $6 for seniors, UVA Faculty/Staff, and UVA Alumni members, and $5 for students. Full-time UVA students may receive one free ticket if reserved at least 24 hours in advance of their desired performance date. Free parking on performance nights is available in the Culbreth Road Parking Garage, located next to the Drama Building.